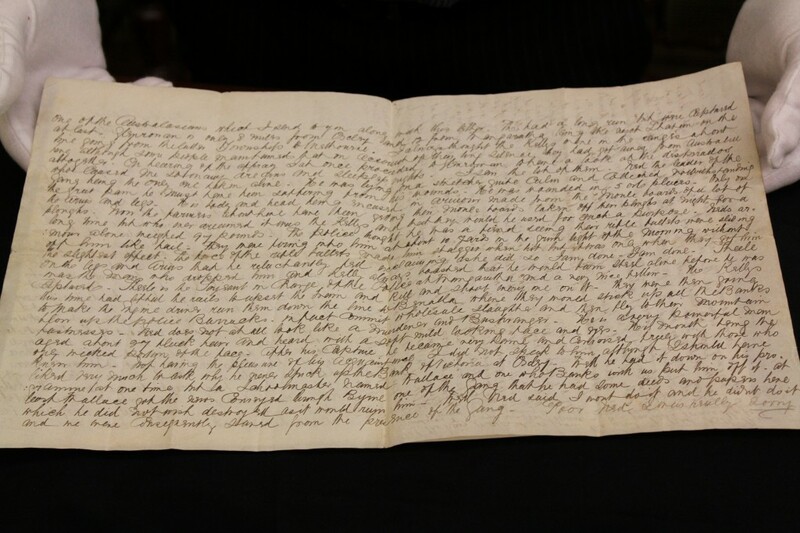 After 133 years, a letter containing an eyewitness account of the dramatic capture of Ned Kelly during the 1880 siege at Glenrowan has been donated to the State Library of Victoria by the descendants of its author – Scotsman, Donald Gray Sutherland. The letter addressed to Sutherland’s family on 8 July 1880 proclaims ‘… the Kelly’s are annihilated. The gang is completely destroyed…’. It continues describing Kelly’s famous armour and the gunshot wounds that finally brought him down. Sue Roberts, CEO and State Librarian described the donation of the letter as extremely generous and a significant addition to the Kelly story. The letter will be on display in the State Library’s Changing Face of Victoria exhibition from Monday. It is also available online with a full transcript via the State Library website. A new Ned Kelly app developed by the State Library explores the compelling details of Kelly’s life. With more than 60 pages of content and images of fascinating historical items including his armour, photos, letters and more, the State Library’s unique collection of Kelly material comes to life. It is free to download from iTunes and Google Play now. Sutherland sailed to Australia in 1876 when he was 24. He worked at the Bank of Victoria in Oxley, eight miles from Glenrowan. He moved from Victoria to NSW and was married for a short time before his death at age 36. He is buried in the Waverly cemetery in Bronte, NSW. Could you please tell us how long will this Letter be on display in the library. As we are from South aust. My husband is very interested in ned Kelly. And would like to come over and visit the library. . I note that Donald Sutherland worked in the Bank of Victoria at Oxley,as a former officer of the State Savings Bank of Victoria(later known as State Bank Victoria) I wonder if this Bank was a forerunner of the SSB/SBV. The State Savings Bank of Victoria began as the Savings Bank of Port Phillip in 1842 and then merged with the Savings Bank to become the State savings Bank of Victoria, in 1912. There was a name change to the State Bank Victoria in 1980. In 1991, the bank was merged into the Commonwealth Bank of Australia.